Green Candy. We’ve only had Sugar Snap Peas this early once in our 15 years, and we’ll have them for a while—this is only our first planting. Enjoy! Well, the rumors were true. 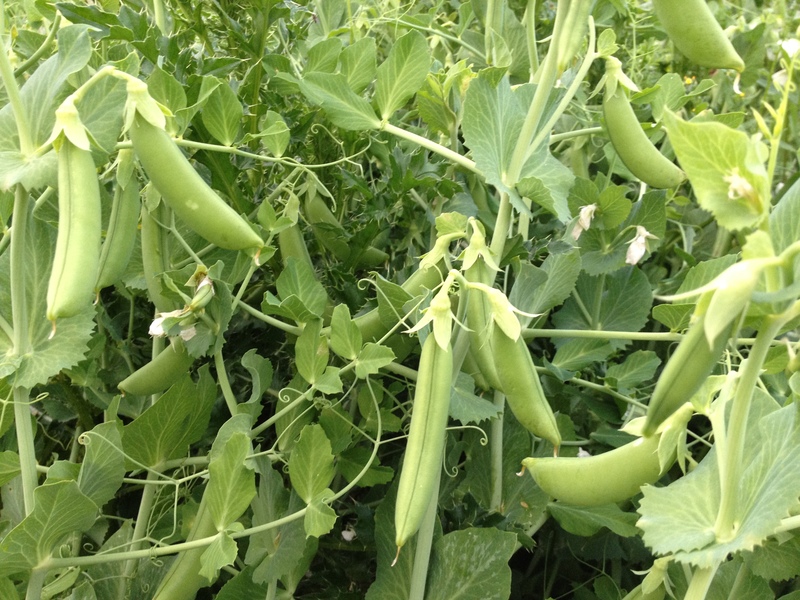 For the second occasion in our history, we have Sugar Snap Peas ready during our Spring Season. They will be sweeter next week, after some temperatures above 70°—there are LOTS still coming on those plants. You can steam or sauté them if you wish, but we end up eating them fresh. I’ve had a lot of questions about the turnips. Some folks think they’re radishes, because the leaves are kind of radishy, but they are a special type of turnip, originally from Japan. There are several varieties now, but they’re referred to as “Tokyo Market”, or “Hakurei”, among other names. They are special because they are sweeter and more tender than typical purple-top turnips. They also have a slightly fruity flavor. Eat them raw in place of radishes, or steam, grill, or gently sauté them. They don’t need much cooking like a big, coarse, winter turnip. We’ve got Cilantro, Dill, and Basil on the way. The spring mix is coming along steadily, so hopefully we’ll have it until the full-sized lettuces come along in a few weeks. The new spinach patch is coming. The new carrots are taking longer than we like, but they’ll be along in time. 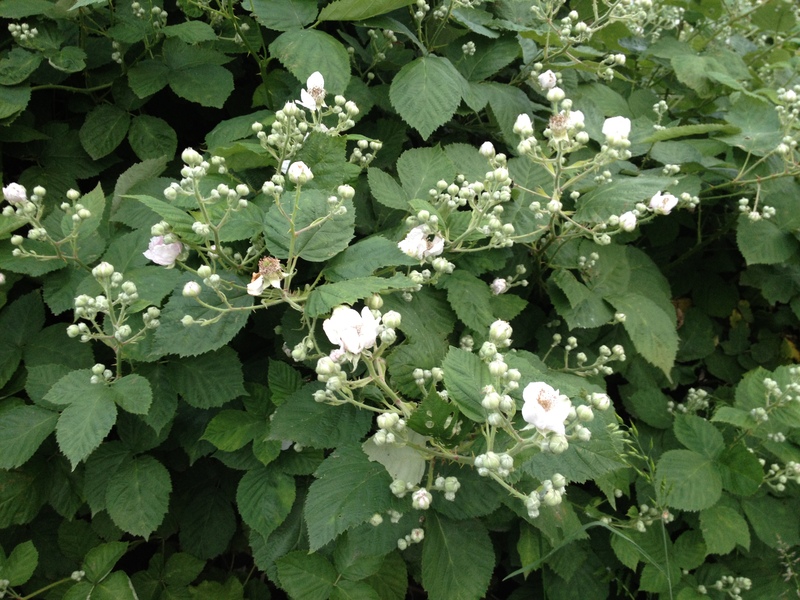 The wild blackberries are starting to bloom. This is where our serious nectar flow for honey lies. Also several weeks earlier than last year. Blackberries are blooming! They’re coming on about a month earlier than last year. The bees know it—one of my hives swarmed on Monday, and it’s killing me that it hasn’t been warm enough to go in and check all the hives out and make sure they’re content. I sure don’t want to lose any now that the real nectar flow is about to come on. This is the busiest time for us, so I apologize if I don’t get back to you right away. And I will be SO glad when school is finally out and we can switch to our summer routine! The spring salad mix with nasturtiums was fantastic for lunch today. We split the greens and flowers into two lunch salads. Chopped peas, onion greens, a shredded carrot (left over from a few boxes back), and pumpkin seeds rounded out the mix. For dressing we made a sweet vinagarette with apricot jam, orange champagne vinegar, olive oil, salt, pepper, and some dried thyme from the farm. Amazing! The peas really are the stars of the show this time of year 🙂 We enjoyed a few in the salad, but will snack on the rest throughout the week. I’m so happy to have fresh veggies for work again! I have a very bad habit of snacking at my desk, but if I’m eating veggies and fruit its not such a bad habit, right? Tonight we had the baby turnips for dinner. They are Killy’s favorite! I trimmed the greens to save for breakfast scrambles or lunch wraps, cut the turnips in quarters and added to a small pot with just enough water to coat the bottom of the pot and some sea salt. I brought the covered pot to a boil, reduced heat to low (remember there’s barely any water in the pot! ), and let it simmer until the turnips were done. They’re extremely tender (not mushy) and sweet when cooked this way. Taste and add just a touch more of salt if needed before serving.